If, so it would be our pleasure to present your property for sale to our buyers. Villacontact is an established real estate agency with intensive local and international network of contacts providing access to a broad range of buyers and maximum exposure to your property. 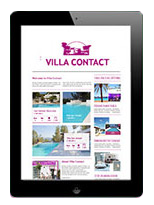 Our multilingual, Ibiza-born Villa Contact team speaks over eight languages, boasting an in-depth understanding of the island and experience in the local property sector. We would like to contact you and discuss in more detail how we can help you sell your property. Please take a moment to send us an email to info@villacontact.com and leave us your contact details and we will be in touch!